Professional sound systems don't have to be difficult to use. If this has been your experience until now, the Performance Combo can help you make your dance studio the perfect place for learning and performing dance routines. We have hidden away all the complexity that comes with a high-quality sound system. You can relax and enjoy using this innovative Performance Combo without any prior training. 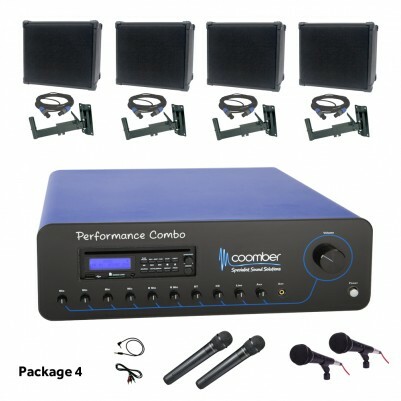 The Performance Combo will give you the power to impress even the toughest audiences. There is nothing like loud quality sound to motivate and get your dancers going. And you will get plenty of that with the Performance Combo whether you choose to have 2 or 4 speakers connected. This is a complete sound system package solution. Everything you need is included: from the amplifier to microphones, speakers, speaker wall brackets and connecting cables. No need to buy anything more, everything you require is included at no hidden extra costs! The Performance Combo is ready to go straight from the box, no wasting time and money configuring a mixer desk and the peripheral equipment.